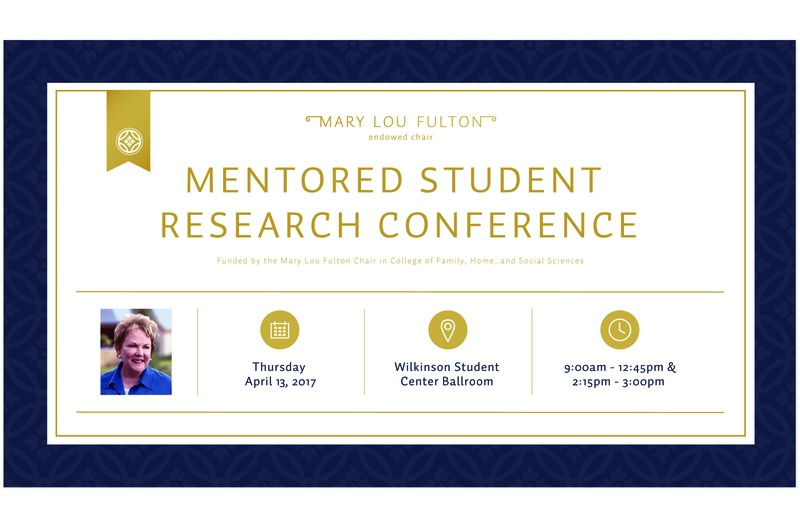 The College of Family, Home and Social Sciences invites undergraduate and graduate students from all departments in the college to participate in the Annual Mentored Student Research Conference funded by the Mary Lou Fulton Endowed Chair. Class Project Participants: Some classes require you to complete a research project. You may use that project to present at the conference. Individual and group projects are welcome. Students with Specific Research Interests: You may have a particular idea of what you would be interested in researching. Search for a faculty member that shares that interest and see if they are willing to guide your project. Students who have been invited by faculty to participate: You may be selected by a faculty member to assist with their research. 1. Create a research project. …or you can go here to get more instructions and view samples of previous winning posters. 3. Submit your poster at FultonChair.byu.edu by the deadline, Thursday, March 30, 2017 at noon. Submissions are already being accepted! • Your participation gives you an opportunity to develop your presentation skills by articulating your findings to a broad audience. • It may help clarify your future educational and career goals. • It looks good on a resume. • Networking- you get to know faculty members who may write letters of recommendation. • You may be able to publish your findings. • You learn more about the research process. Cash prizes are offered for winning posters in each department. All students are welcome to participate! For more information, visit FultonChair.byu.edu.